We assess this well thought-out and unobtrusive 'Sqish' dish. 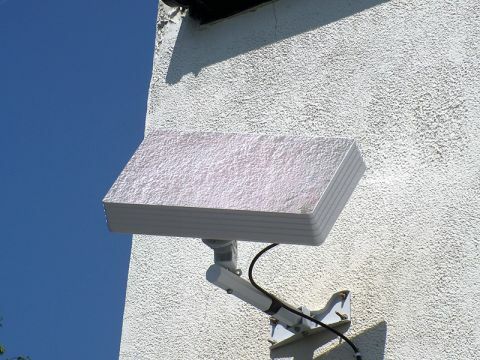 The Selfsat-H10D (or 'Sqish' as UK distributor The Satellite Shop calls it) is intended to be a 'quirky contemporary alternative to a satellite dish'. It has a width of 475mm and a height of 259mm and is best partnered with satellites that offer very high signal strength in the UK, i.e. the Astra 2/Eurobird constellation that brings us Sky Digital and Freesat. The Korean-made dish boasts a gain of 33dB and an integrated 0.7dB universal LNB. A £169 dual-LNB version is also available for users of twin-tuner PVRs, and a quad LNB-fitted dish is also soon to appear, priced £189. Key to its potential success is what The Satellite Shop calls 'Sqishoflage'. Take a hi-res digital photo of the area where the Sqish will be mounted and the company will print the image onto a self-adhesive sheet and post it to you. The sheet - UV-stable and matt in finish - can then be stuck onto the front of the Sqish before it's mounted. This innovative £25 service helps the Sqish to blend in. Supplied with the aerial is a well-made, multi-purpose pole and bracket that allows it to be mounted on a pole, windowsill or wall/fence. Most will opt for wall installation; unfortunately, the ample clearance provided by the pole means that the Sqish protrudes significantly. The Satellite Shop is working on new hardware that will enable the Sqish to be mounted closer to the wall. The Sqish is no more difficult to erect than a standard dish. The wall bracket could be better; it's pressed outwards to form a lip that makes tightening nuts (Rawlbolts and so on) tricky because there's little clearance between the mounting holes and the metalwork. Alignment is also easy. In addition to the usual azimuth and elevation adjustments - which are precise, with no unwanted play - is the ability to rotate the panel. This is the equivalent of the skew adjustment found on the LNB bracket of conventional dishes which ensures that the LNB's vertical and horizontal probes are accurately aligned with the appropriately polarised signals arriving from the satellite, thereby maximising signal transfer. In the case of the Sqish you have to rotate more than just the LNB! The only thing you have to be careful with is applying the Sqishoflage. Once it's on it's difficult to get off! Using a professional Telemann digital meter, we trained the Sqish first on Hot Bird and then Astra 1 just to see what results could be achieved. In both cases we were able to receive most of the channels. Sadly, rain caused the pictures and sound to start breaking up badly. The Satellite Shop says the Sqish manufacturer will be introducing a larger (530x300mm) model; this should improve reception of such satellites. But the standard Sqish worked very well with Astra 2/Eurobird in our South-East site. We only suffered dropouts during a downpour - but then again, the same was true of our reference Zone 1 (430mm) Sky minidish. Those living in the far North, where a larger Zone 2 (600mm) dish is needed, should wait for the bigger model. The Sqish is an excellent idea, and fulfils its brief. But it's not cheap. The same outlay will buy you three Zone 1 dishes, plus LNBs.